_ Bracelet measure: 22cm (8.5 inches) Length with 2 lobster-claw-clasps, you can adjust to your comfortable size. _Necklace measure: 47.5cm (18.5 inches) Length with 1 lobster-claw-clasp. _22 Charms: Different shape have different meaning. HOW TO CARE WITH YOUR CHRISTMAS GIFT? Not wearing it while sleeping. Not wearing it while bathing. Placing it into the box while not wearing it. We always have an eye to good customer service as we receive orders. Your reviews for this new arrived item will help us catch the things you focus on and make the things better. If you have any question about order and product, pls send us message. We will reply your message within 24 HOURS. Click the ADD TO CART button and order your Christmas Advent Calendar DIY 24 Charms now ! 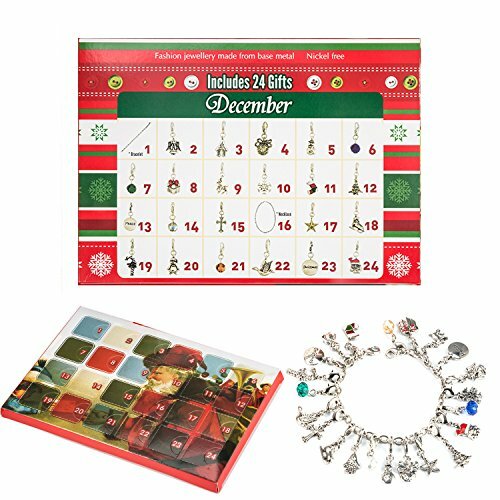 Christmas Countdown Calendar: From Dec 1 to Christmas, everyday has a special number and each number is a different jewelry gift. From Dec 1 open first Window: a nice Bracelet, continue to open window 2,3,4..... , coming a different and special charms everyday. When you open to Window 24th, Christmas is arrived.It is a Fun Christmas Countdown Calendar. Advent Calendar Jewelry: Each jewelry made from environmental alloy with white gold plated, Nickel, Lead and Cadmium free, hypoallergenic. Promotes beauty, health, good luck, and healing. DIY Parent-child Activities: When you see this outer box, Christmas is approaching, It is an ideal Special Christmas gift for your child, Play and Design with them, Harvest more family Love in the Special December. Advent Calendar Christmas Gifts Box packed: Unique set with Gift Box comes with 22 charms and 1 bracelet(first window) and 1 necklace(Window 16),Decorative Boxes, and background panels in your own style.Prepar for Christmas by opening a window each day during Advent to Reveal a piece of charms. Perfect after-sales service: Zhuofu Committed to provide the best Product and the best services to all our customers, meet and exceed your expectations. If you have any questions about this product by Melon Boy, contact us by completing and submitting the form below. If you are looking for a specif part number, please include it with your message.